A son, Edward to Henry VIII and Jane Seymour at Hampton Court Palace. He was created Duke of Cornwall. Edward was christened at midnight at Hampton Court Palae. Edward’s godfathers were the Duke of Norfolk and Thomas Cranmer. His half sister, Mary, was godmother. Edward’s mother, Jane, was taken ill from puerperal fever. The Bishop of Carlisle administered last rites to Edward’s mother, Jane Seymour..
Edward’s mother, Jane, seemed better and it was hoped that she would begin to improve. Edward’s mother, Jane, was taken ill again. Edward’s mother, Jane, died of puerperal fever. Edward’s mother, Jane, was buried in St George’s Chapel, Windsor. Margaret Bryan was given overall charge of Prince Edward while Sybil Penne became Edward’s chief nursemaid. Edward’s father, Henry VIII, married Anne of Cleves in the Chapel Royal at Greenwich Palace. The ceremony was performed by Archbishop Cranmer. Edward’s father, Henry VIII, divorced Anne of Cleves. Edward’s father, Henry VIII, married Kathryn Howard at the Palace of Oatlands. The ceremony was performed by the Bishop of London. Edward was taken ill with quartan fever but recovered. Kathryn Howard was executed for treason. Edward performed his first public duty when he entertained a group of Scottish noblemen that were in London. Henry VIII signed this peace treaty with Scotland. The treaty was sealed with the betrothal of Edward to the infant Mary Queen of Scots. Henry asked that the infant Queen be brought up in England to prepare her for her future role as Queen of England. Edward’s father, Henry, married Katherine Parr in the Queen’s Privy Chamber at Hampton Court Palace. Edward’s stepmother, Katherine Parr, oversaw Edward’s education. Edward began his formal education. He was taught classics, theology, languages, mathematics, geography, grammer and science as well as gentlemanly pursuits and sport. 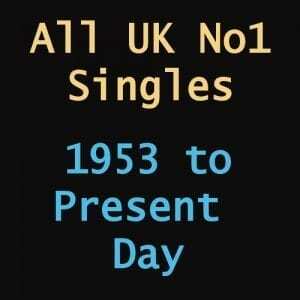 His tutors were Richard Cox, John Cheke, Roger Ascham and Jean Belmain. The Scots repudiated the peace treaty with England and renewed their alliance with France instead. Edward and his half sisters, Mary and Elizabeth, were at court to celebrate Christmas. A new Act of Succession stipulated that Edward should succeed Henry to the throne with any children from his present marriage being next in line. Lady Mary and Lady Mary were next. Henry VIII sent Edward Seymour, Earl of Hertford, to invade Scotland and burn Edinburgh to the ground in a bid to make the Scots honour the Treaty of Greenwich and send Mary to England. The Earl of Hertford’s harsh treatment of the Scots was coined ‘The Rough Wooing’. Edward, along with his half-sisters, Elizabeth and Mary, attended a supper party in Hyde Park on the eve of Henry’s departure for France. Henry VIII invaded France at the head of an army of 40,000 men. Edward, his two sisters and Katherine Parr left London to avoid an outbreak of the plague. They stayed with the Countess of Rutland at Oakham. Henry VIII returned to England truimphant. Henry was taken ill with a fever and severe pain in his legs. Henry declared that Edward Seymour should be head of a regency council to govern until Prince Edward reached his majority. Henry VIII died at Whitehall Palace in the early hours of the morning. 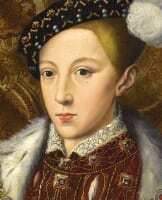 He was succeeded by his son as King Edward VI. Edward Seymour declared himself ‘Protector of all the Realm and Dominions of the King’s Majesty’. Edward Seymour rode to Hertford where he collected the young King Edward and took him to his half-sister Elizabeth’s residence at Hatfield. There he told the two children of their father’s death. Chancellor Thomas Wriothesley announced the death of Henry VIII in parliament and ordered proclamations that Edward was now King Edward VI. He was placed under the control of Edward Seymour and was prevented from seeing his stepmother or step-sisters. Barnaby Fitzpatrick was appointed to be Edward’s whipping boy. Because courtiers could not punish their King, if young Edward was naughty Barnaby would be punished instead. 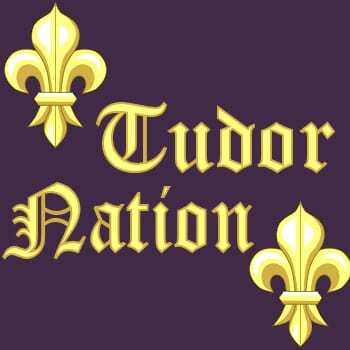 The leading nobles swore allegiance to Edward at the Tower of London. Henry VIII was buried in St George’s Chapel, Windsor next to Jame Seymour. Edward was crowned King of England at Westminster Abbey. After the ceremony a banquet was held in Westminster Hall. Edward Seymour became the Duke of Somerset. His brother, Thomas Seymour became Baron Seymour of Sudeley Castle and was created Lord High Admiral. Edward signed a document giving Edward Seymour, Duke of Somerset, the power to appoint members of the Privy Council and to consult with them at his own choosing. This effectively gave him full control of the country. This move was only opposed by Thomas Seymour and Thomas Wriothesley. Edward’s stepmother, Katherine Parr, secretly married Edward’s uncle, Thomas Seymour. Although Katherine was in love with Seymour it is likely that he married for power rather than love. English forces led by the Duke of Somerset defeated the Scots at the Battle of Pinkie Cleugh. Somerset hoped to persuade the Scots to make alliance with England and allow the marriage of Edward to Mary Queen of Scots to go ahead. Katherine Parr discovered her husband, Thomas Seymour, with Edward’s half-sister, Lady Elizabeth. Elizabeth was sent to live with Sir Anthony Denny. Mary Queen of Scots had been smuggled out of Scotland to France where she married the Dauphin, Francis. Katherine Parr died of puerperal fever after giving birth to a daughter, Katherine. Thomas Seymour began writing letters to Lady Elizabeth. It is likely that he hoped to marry her. Thomas Seymour was arrested and charged with embezzlement of crown funds. He was found guilty. With Edward’s full approval, Edward Seymour introduced the Protestant Book of Common Prayer and outlawed many Roman Catholic practices. The clergy were given permission to marry. A number of revolts against the Book of Common Prayer broke out. The most serious rebellions were in Devon and Cornwall. There were revolts against changes that were made to common grazing ground. Members of the Privy Council began to complain to Somerset about his government of the country, blaming the rioting on his proclamations. Henry II of France realised that England was weak and lay siege to Boulogne. Edward Seymour realised his position was in danger and took himself and King Edward to Windsor Castle. Edward Seymour, Lord Somerset, was arrested by the Council. John Dudley realised that England could not afford to continue war with France and sent a delegation to negotiate peace. Edward was betrothed to Princess Elisabeth, daughter of Henry II of France. John Dudley married Lady Jane Grey, granddaughter of Henry VIII’s younger sister, Mary, to his son, Guilford Dudley. Edward was buried in the Henry VII Lady Chapel at Westminster Abbey.